At this ambassador-level meeting, the two sides lauded the upgrade of bilateral relations to strategic partnership in November 2018 and recognised positive outcomes in their cooperation in different areas over the years. Currently, Russia is ASEAN’s eighth biggest trade partner and tenth biggest investor. Two-way trade has been increasing, reaching 16.79 billion USD in 2017. As many as 79 out of 139 action lines in the ASEAN-Russia Plan of Action in the 2016-2020 have been implemented in various areas, from politics-security, economy, culture-society, to connectivity and development gap narrowing. Alongside, ASEAN and Russia have conducted cooperation plans for the 2016-2020 period covering energy, agriculture and food security, along with the action plan on science-technology-innovation for the 2016-2025 period. The joint projects and activities have been funded by the ASEAN-Russia Dialogue Partnership Financial Fund, which sees Russia’s annual 1.5 million USD contribution. ASEAN countries lauded the efficiency of the ASEAN Centre, the Moscow State Institute of International Relations (MGIMO) over the years, which positively contributes to the promotion of exchange and scientific collaboration among universities and research centres of Russia and the ASEAN countries. 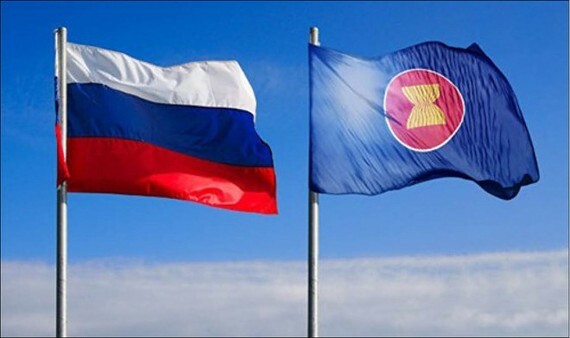 Russia affirmed that it considers ASEAN as one of the top priorities in the country’s external policy, and highly values the central role of the grouping in maintaining peace and stability in the region. Russia pledged to support initiative and priorities of Thailand as the ASEAN Chair in 2019, while continuing supporting the association in implementing the ASEAN Vision 2025 and Master Plans in all three key pillars, and strengthening cooperation in ASEAN-led mechanisms. In the future, the ASEAN countries and Russia will implement the rest action lines, fostering cooperation in areas of shared concern, especially in areas of Russia’s strength and ASEAN’s demand such as trade and investment facilitation, science-technology, digital economy, connectivity, development gap narrowing, smart city network building, personnel training, and climate change. The two sides agreed to realize cooperation proposals such as the setting up of ASEAN-Russia dialogue partnership on disease prevention and control capacity building with Russia training 100 ASEAN experts in the fields. They will conclude negotiations and sign a memorandum of understanding on affiliation on natural disaster management, while organising the second meeting of the ASEAN-Russia Think Tank, the ASEAN-bilateral meeting on science-technology cooperation, the education forum, the ASEAN-Russia cultural programme and the fifth ASEAN-Russia summit in 2019. They will also strengthen cooperation in other areas such as trade and sports.